It’s no secret that I love the great outdoors. In fact, I consider nature to be an integral part of human wellness. That’s why I included it as one of the pillars in my book The Healing Revolution: Eight Essentials to Awaken Abundant Life, Naturally. To fully enjoy the outdoors, though, it’s important to prepare yourself so Mother Nature’s hiccups can’t throw a wrench in your plans. Before you hit the trails for hiking, camping, or biking, make sure you’ve packed all the health-protecting essentials like extra water, mineral-based sunscreen, and low-sugar, high-protein snacks. And don’t forget a well-stocked first-aid kit. It should have all the tried-and-true standards like bandages, gauze, iodine, and tweezers. But what about all-natural remedies for common outdoor snags? In that department, Dr. King’s has you covered. No outdoor first-aid kid is complete without these indispensable natural products. Whether it’s from all the miles of trail you put behind you or from the not-quite-luxurious sleeping arrangements, spending time in nature often comes with some aches and pains. Be prepared for the sore muscles, bruises, and stiffness with nature’s favorite pain reliever: Arnica montana, Latin for a mountain daisy. As homeopathic medicine, Arnica is famous for relieving swelling, bruising, and pain from minor injuries and overexertion. Dr. King’s Arnica formulas are available as a homeopathic oral spray (Advanced Arnica), Arnica Gel, or Advanced Arnica Soothing Cream. Flowers, trees, fresh water, and beautiful vistas… Nature is restorative for humans and insects alike. Don’t let your outdoor experience be ruined by buzzing, biting, stinging pests. Protect yourself with Dr. King’s Bug Away, which temporarily relieves the itch, swelling, and irritation of insect bites and stings. may help tame the resulting swelling, itching, and burning so you can get back to enjoying your adventure. A few bumps and bruises are, unfortunately, par for the course with outdoor adventures. 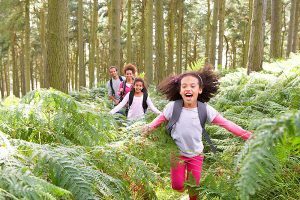 If you have a run-in with a wayward branch, trip over a rock, develop a blister, or just generally overexert yourself, reach for Dr. King’s Advanced First Aid. This oral spray formula provides temporary relief of pain, sprains, scarring, bruises, and traumas to the skin and soft tissues. One of the benefits of spending time outdoors is that the sunshine tops off your body’s Vitamin D reserves. But sometimes we tip the scales from just enough sun to too much. If you find yourself with a sunburn while you’re out adventuring, slather on the aloe vera gel for cooling relief. And next time, remember to cover up before your skin has a chance to start reddening. Sunburns increase skin cancer risk. Aloe vera gel can also soothe minor campfire burns and dry or irritated skin. Wherever your adventures take you, make sure to prepare for the unexpected with these remedies from nature, for nature.